We climbed Catbells like a pair of moutain goats, reaching the top in record time! 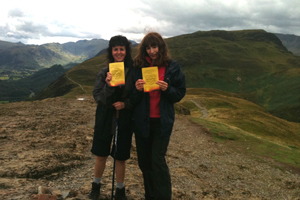 Here is photographic evidence of us at the top, proudly displaying our Northumbria Healers flyers. We were accompanied by 4 ladies who work with June and Emily the dog who all followed. Emily had to be passed by hand up the rocky slopes as her paws had no purchase. Everyone had a grand day out, and we are sincerely grateful to our sponsors. Thank you so much. We will report on the final amount raised but it is looking to be in the region of £300. And next year …onward and upward… higher and higher!